"I never wanted to be a businessman, you know?" says Bruce Iglauer, president of Alligator Records. Today he's finishing the label's semiannual distribution of royalties, working from his office on the top floor of a homey north-side three-flat. 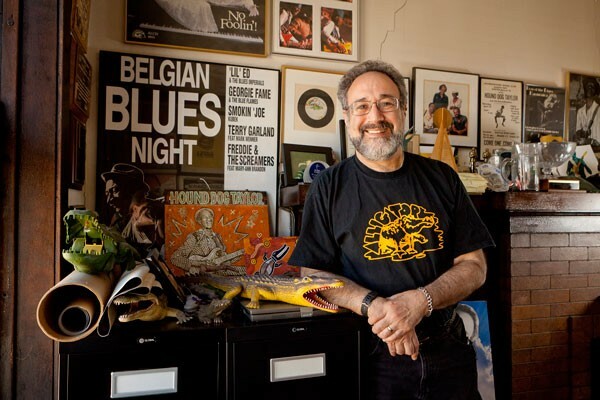 It's cluttered with memorabilia and detritus from Alligator's 40-year history, for most of which time it's been the undisputed number one blues label in Chicago. Photos, portraits, and posters featuring current and former Alligator artists—James Cotton, Little Charlie & the Nightcats, Koko Taylor, Fenton Robinson—line the walls. Piles of CDs and LPs cover on the floor, and his desk overflows with correspondence. All afternoon Iglauer has been jotting down notes, sealing payments in envelopes, and fielding phone calls. He glances pointedly at my tape recorder. "The big, evil record-industry guys," he says, grinning, "who are busy sending out checks!" Paperwork wasn't what Iglauer envisioned himself doing when he launched his label in 1971. But there's a lot he didn't foresee: the evolution in the blues that would carry its leading edge further away from the Alligator sound, the demographic drift among fans and musicians that would transform the label's identity, the havoc the Internet would wreak on the music business. But Alligator has weathered all that, and it's still in the black—if only barely. The label is throwing itself a 40th birthday party all year, and on June 12 the final set of the Chicago Blues Festival—with Lonnie Brooks, Eddy "the Chief" Clearwater, and more—will be part of that celebration. Iglauer moved to Chicago in January 1970 from Appleton, Wisconsin, where he'd majored in English at Lawrence University. He got a job at Jazz Record Mart, and had already assisted owner Bob Koester on a few recording sessions—Koester also runs the Delmark label, then Chicago's most important outlet for jazz and traditional blues—when he heard slide guitarist Hound Dog Taylor at Florence's Lounge, near 55th and Shields. Inspired, Iglauer approached his boss with a proposition: "I suggested to Bob, not only that there should be a Hound Dog record, but—and here's the balls—that I should produce it. The 'I should produce it' was the kiss of death for the Hound Dog Taylor record on Delmark." Undaunted, Iglauer produced the album without help and pressed 1,000 copies of Hound Dog Taylor & the HouseRockers on his own new label—named for his habit of clicking his teeth in time to music, which had prompted a girlfriend to call him "my little alligator." He loaded as many LPs as he could fit into the trunk of his Chevy and hit the road, taking a meandering route to New York. Radio was more informal then, so Iglauer could show up at a station (he targeted college and "progressive rock" stations), hand a copy to a DJ, and talk him into playing it. Then he'd visit the nearest record distributor and convince the folks there that, since the record was getting airplay, they should sell it to local outlets. The album ended up selling about 9,000 copies in its first year, which Iglauer says was "pretty 'platinum' at the time" for a blues LP. Within four years, albums by harpists Big Walter Horton and Carey Bell, guitarist Son Seals, and guitarist Fenton Robinson—as well as a follow-up from Hound Dog Taylor—had established Alligator as an important player in indie blues. Koko Taylor's 1975 Alligator debut, I Got What It Takes, was nominated for a Grammy, and within a few years Taylor—until then a regional artist whose main claim to fame, "Wang Dang Doodle," had charted nearly a decade earlier—was feted worldwide as Queen of the Blues. Alligator in turn had become the leading blues label in the U.S., a status it's held ever since. Alligator's slogan is "Genuine Houserockin' Music," and its trademark sound blends 12-bar blues tradition and rock 'n' roll fire. Rowdy and boogie-driven but still emotionally rich, it emphasizes heavy drums, fretboard pyrotechnics, and leather-lunged vocals. Though since the beginning the label's fans have been predominantly white, Alligator signed African-American acts almost exclusively until the mid-80s, when artists like Johnny Winter, Lonnie Mack, and Little Charlie & the Nightcats began to appear on its roster. Today its lineup is more than 50 percent white, and JJ Grey & Mofro, who play a postmodern hybrid of roots music, blues, swamp rock, and redneck jam-band fare, are one of Iglauer's best-selling acts. Whether this represents a sort of progressive color blindness or rather the flat-out appropriation of black music by white people remains a matter of debate. It's certainly possible to paint someone like Iglauer as an abetter of cultural imperialism, but it's also possible that the kind of music he's always released is simply made more often by white people these days. "I was marketing to the white audience," Iglauer says. "No doubt about it. [But] it's surprising to me that my roster has become what I think is a majority white roster now. When I started, there were so many [African-­American] players who had grown up in the music, and they had well-defined and very unique styles. The tradition hadn't been as mined as it is now. I am constantly pushing people: Where are your songs? Being a good interpreter is fine, but it's not sufficient to help you make a mark for yourself. "If I'm criticized, and I assume I am, for not signing more African-American artists, the answer is: show me an African-American artist who has got a vision for where to carry some blues into the future, who is an efficient bandleader, who has their act together businesswise enough so that I can work with them, who doesn't have a significant drug or alcohol issue, and who has live charisma, and I will take that artist real seriously." There are in fact such artists in Chicago, ranging from fiery guitarist Tre to vocalists like Willie White, Jeannie Holliday, and Theo Huff. But many of them—including those three singers—work primarily in the genre known as southern soul or soul-blues. It's rather distant from the guitar-heavy sound associated with Alligator—with its synthesized backing tracks, melisma-heavy vocals, and influences drawn from neosoul and hip-hop, it's designed to appeal to current African-American pop sensibilities. In other words, soul-blues artists make records that most white blues fans—the Alligator demographic—would immediately write off as "inauthentic." Iglauer doesn't get involved in debates about authenticity, but he's adamant about live drums: "Blues is the antithesis of disco," he says. "Blues is performed to human time, not machine time." He also admits his inexperience in dealing with the African-American blues market. "When I started," he says, "I did reach out to some black DJs and programmers. And very quickly I understood that there was a certain kind of sound they were looking for, [and] that there was a lot of old-boy network. You couldn't just walk in as a stranger and say, 'Hi, here's an artist you've never heard of.' I don't think there's any label that effectively works both blues in—I hesitate to say the 'white market,' but I guess that's what I mean—and southern soul in the black market." A more immediate concern than which audience or aesthetic to cultivate, though, is the issue of how to hold on to paying customers at all. It doesn't help that white audiences tend to see Alligator's favored blues style not as progressive—which it was, to some ears, in the 70s—but as a throwback. Every record company has to deal with the uncertain future of the industry in the age of Mediafire and BitTorrent, but blues labels in particular—like jazz and folk labels—have to work with older musicians less able to adapt to a climate where artists increasingly make their money on the road. Contrary to certain utopian predictions, the rise of the DIY imperative that's accompanied the decline in record sales hasn't resulted in a brave new world of opportunity for musicians—at least not for musicians who aren't healthy, financially unencumbered twentysomethings (no kids, no aging parents, no mortgage) who can live on the money they eke out from near-constant touring (and whatever job near-constant touring allows them to hold down at home). "The blues musician almost certainly doesn't have health insurance," Iglauer says. "He doesn't have any retirement, has no income if he gets sick, and no social safety net whatsoever. Most bands are prepared to drive 300 to 500 miles between gigs. So you're talking about driving anywhere from seven to 12 hours and then playing for three sets, and then sleeping for six hours and doing it again—if you're lucky enough to have gigs two nights in succession and not [have] Monday, Tuesday, and Wednesday off . . . sitting in a motel and watching the money from Friday, Saturday, and Sunday drain away." Iglauer decries illegal file sharing as music consumers adopting the same callous indifference to artists that the worst labels have long been notorious for. "I heard from the moment I came to Chicago about how record people screwed musicians," he says. "I've tried from day one to be scrupulous about my royalties. I remember when I sent the first royalty check to Gatemouth Brown. His manager called me and said, 'Gatemouth told me that he has never received a royalty check for record sales from any other label in his entire recording history.'" This was in the 80s, and Brown's discography stretches back to the late 40s. "Last week [a deceased artist's] granddaughters came to the office because it was royalties time," Iglauer continues, "and they didn't want to wait for the mail because they needed the money that desperately because they're poor people. I was just on the phone with [another artist's] wife, and I said the royalties are coming out a little late. And she said, 'Bruce, we trust you.' Every time somebody illegally downloads, they're giving the giant finger to the artist they supposedly love and basically saying, 'Your music has no value.' When it happens with an older artist or a dead artist, you're just saying, 'I'm screwing your family.'" "Well, Alligator is making a profit. A very modest profit, but by the standards of the record industry right now, any profit is a success. And part of the reason we're making a profit is because we're trying to make timeless records; we're trying to make records that [will] have real content and real emotional meat and real meaning to people in five or ten or a hundred years. "People in my family tend to live to ripe old ages. I'm 63, and I've been working since 5:30 this morning. If I can do this for another 20 years, I'd really like to. Another 40 would be even better."